The Someday/Monday dichotomy captures one of the core challenges in teacher professional development around education technology. On the one hand, deep integration of new learning technologies into classrooms requires substantially rethinking pedagogy, curriculum, assessment, and teacher practice (someday), because for technology to make a real difference in student learning, it can’t just be an add-on. On the other hand, teachers need to start somewhere (Monday), and one of the easiest ways for teachers to get experience with emerging tools is to play and experiment in lightweight ways: to use technology as a substitution for something that they have previously tried in the past. Teachers recognize the need to imagine a new future, to strive towards the creation of innovative, technology-rich learning environments that provide our students with the best possible experience (someday). In the meantime, they seek out new activities and strategies to try out on Monday. Both pathways are critical for teacher growth, and necessary to create meaningful, sustained changes in teaching and learning. In this four-part series, we are using the Someday/Monday template to explore four dimensions of using tablets, such as iPads, in educational settings, examining how teachers can take students on a journey from consumption of media to curation, creation, and connection. In the first part of this series, we used the Someday/Monday template to explore Consumption. More specifically, we addressed the impact of iPads on focused and connected reading. This week, as we continue to explore the continuum, we will look at Curation. Curation, the collection of works for public exhibit, is an ancient inclination dating back at least to Herodotus. His writing of The Histories serves as one of the first curated collections of learning artifacts on record. Since then, whether it's manuscripts, texts, or books, teachers have curated learning objects as a way to share with their students. If we reflect on the evolution of pedagogy, the proverbial Sage-on-the-Stage model takes its root in the fact that one person curated all of the information and then bore the responsibility to distribute it to his or her students. “We’re no longer going to have a single canon where a central authority will be able to decide what’s great and what’s not." As technologies have developed, the tools and objects of curation have become increasingly accessible. For decades, teachers have arranged collections on bookcases, but now we create playlists of songs, folders of bookmarks, albums of photos, wall posts of life events, and portfolios of academic work. With this abundance of platforms for curation, teachers no longer curate to distribute works, they curate to model curation. We live in a time where we encounter unlimited intellectual stimulation, and this abundance creates its own challenges. The critical task is not finding information or stimuli, but organizing, cataloging, archiving, and developing habits and practices to exercise control over our surfeit of opportunity. In his recent book Truth, Beauty and Goodness Reframed, Harvard Professor Howard Gardner argues for the importance of curation in learning to appreciate beauty. He states that the abundance of great art and literature, and our access to them, has destabilized the notion of a fixed set of canonical works. “We’re no longer going to have a single canon where a central authority will be able to decide what’s great and what’s not....Everybody can make his or her judgments about beauty, and it doesn’t impinge on anybody else.” To develop our own canons, to learn to appreciate beauty, he recommends maintaining portfolios or journals of art, music, writings, and experiences in order to better appreciate the distinctions among them - to make sense of which pieces are most beautiful. What would a math class look like where students learn to compute, prove, derive, and intuit, as well as to discern and appreciate mathematical beauty? What about a history class where students maintained a portfolio of beautiful artifacts and ideas from multiple periods? How might efforts to curate benefit from the portability and ubiquity of mobile devices? What would a “relevance portfolio” look like, where students catalog their daily encounters with ideas or experiences? What other kinds of portfolios could students create over the course of their academic career? In a world of informational abundance, we no longer face Herodotus’ challenge of finding scarce information. In a world of portable supercomputers and ubiquitous access, the task of the teacher is no longer to collect and distribute, but to empower students to curate their own collections of intellectual resources. When first stepping into an iPad or tablet classroom, organizing physical and digital content emerges as an immediate challenge. Teachers have printed materials and trusted textbooks in conjunction with digital resources. In elementary classrooms, teachers also balance the need for paper, crayons, and blocks with effective uses of mobile devices. Evernote is one of the best apps to start to bridge this gap between the digital and physical. With a free account, teachers instantly have access to all of their materials from anything with a web browser. Using a familiar metaphor - notes and notebooks - as an organizational structure, teachers can curate lesson plans, student work, curriculum resources, etc. into the app. Scans of printed materials, or pictures of student work, capture the physical world. Audio notes allow teachers and students to verbally reflect on the content. Content curated from around the web can be clipped to notebooks for later use. 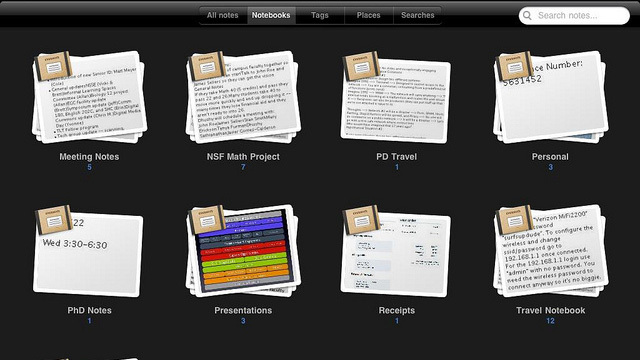 Students can also have Evernote accounts for curating their own learning artifacts. At Trinity School Atlanta, students in grades 2-6 use Evernote for note taking, curation, and reflection. “We started with a big idea and have been continuously refining it to build not just a space, but an experience that helps students learn more about themselves over time, while informing teachers and parents in meaningful and authentic ways,” writes Rhonda Mitchell who leads that portfolio initiative. Within this context, students and teachers are curating not only artifacts but also their experiences. While Evernote is a good tool for personal connections, other apps and web tools allow teachers and students to create public facing collections. Students can collect, organize and annotate web sites on Diigo, books on GoodReads, photos of Flickr, scholarly references on Zotero, music on SoundCloud, and anything and everything on a Tumblr or WordPress blog. Tools such as Touch App Creator or Tactilize allow teachers and students to collect and reflect on learning artifacts from different media and to publish these collections to broad audiences. Tactilize simplifies publishing magazine like content. Touch App Creator allows users to organize eBooks, text, images, and web-based content together into web apps hosted on Google Drive. Without needing web hosting or even knowledge of programming, teachers can combine a set of learning objects for their students or students can create apps with collections organized for public presentation and distribution. With these different apps and web services for the collection and display of curated content, the technology for curation is Monday-ready. The harder questions are pedagogical and curricular. What should students curate? In the spirit of Gardner’s beauty journals, we should aim not just to help students get organized, but to closely and intentionally examine what they read, watch, see, hear, and collect. Justin Reich is a Fellow at Harvard’s Berkman Center for Internet and Society and co-Founder of EdTechTeacher. Beth Holland is a Senior Associate with EdTechTeacher.